The Drafting student is taught to translate the ideas, notes, rough sketches, specifications, and calculations of engineers, architects, and designers into working drawings, which are used by skilled craftsman in manufacturing products. 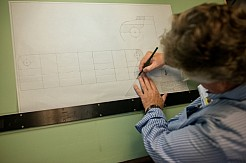 Instruction in the fundamentals of material selection, strength and manufacturing processes are included in the program. 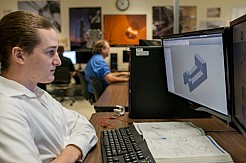 The drafting program includes technical illustration and drawing techniques, the use of engineering handbooks and tables, Computer Aided Drafting and Design (CADD), rapid prototyping systems and other physical sciences. Students may specialize in Mechanical Design, Architectural Design or obtain a working knowledge of both areas. All instruction is self paced with emphasis on the use of CADD and 3D Parametric Design. All course material prepares students for certification by American Design Drafting Association (ADDA); Certified SolidWorks Associate (CSWA) exam; and AutoDesk Certified Associate exams. Students may qualify for the latest educational versions of AutoDesk Inventor and AutoCAD at no cost.